The Ministry of Tribal Affairs (MoTA) and the Ministry of Environment and Forests (MoEF) had set up a joint committee to inquire into the status of implementation of the Scheduled Tribes and Other Traditional Forest Dwellers (Recognition of Forest Rights) Act 2006 and to suggest ways in which policies and institutions need to be changed to enable implementation. The Committee members were selected from a wide spectrum of stakeholders consisting of retired civil servants, forest officers, tribal department officers and representatives of Civil Society Organisations and NGOs. The Committee has completed its final report and findings. 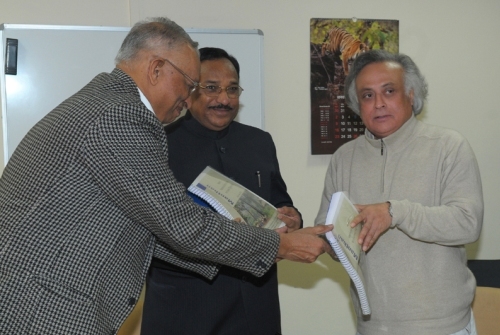 This National Committee report on Forest Rights Act (FRA) has now been submitted to Shri Kantilal Bhuria, the Minister for Tribal Affairs in the presence of the Minister of State for Environment and Forests (Independent Charge), Shri Jairam Ramesh. The full report can be downloaded from the MoEF website (click here) The details of the Committee members, their profile and the Report completion process can be found at the FRA Committee website (click here). Based on the Report, the fate of the forests in India and our biodiversity will be determined. The right of forest dwellers no doubt needs to be addressed as these are the people living closest to nature. But in the rapidly globalizing world, when the pace of information technology is changing perceptions, mindsets and everything very quickly, some forest dwellers have not remain untouched. Only if the report addresses such key concerns, and is as practical as is the situation today in the country, we can hope for a safe, secure present and a green future. PrevDelhi University’s Newly Appointed Vice-Chancellor Shows the Way! NextWelcome New Year 2011: International Year of Forests and More! genuinely enjoy reading through your posts. Can you recommend any other blogs/websites/forums that go over the same subjects?